Tackling a big renovation job is an exciting prospect and something that many homeowners anticipate for many years. Once the project reaches the planning stages, there are several things that homeowners can do to ensure that the outcome is in line with their expectations. 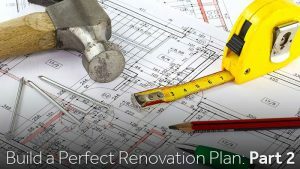 Creating a renovation plan is a great place to begin. The team at Zippy Shell Greater Columbus would like to share the following tips on how to make your project an excellent experience with a wonderful result. The professionals that you select to complete your home renovation project may have years of experience and impressive portfolios, but they can’t read your mind, and they have no way to know what you consider to be the ideal outcome of your project. Making a project plan is the best way to communicate your concept to the pros who will take those ideas and turn them into a finished product. Don’t be shy about outlining your perfect project, even if you know that certain elements will fall far outside the scope of your budget. Your contractors can get a good feel for the result you are trying to achieve just by looking at your dream plans. In many cases, they can suggest alterations to bring the project closer to that ideal while remaining on time and under budget. The next step involves working up a budget for your project. This is often more of an art form than a science, as costs can fluctuate due to a wide range of factors. However, having a solid overview of what to expect when it comes to the financial aspects of a renovation can make it far easier to make critical decisions and keep the project moving forward. This stage involves a great deal of communication with contractors, suppliers and other professionals. The next step is also the most challenging. Once you know what you would like your final product to look like, and you know how much it will likely cost to reach that goal, it is time to reconcile the two. This is a process of compromise, in which homeowners have to decide which elements of the project are most important to them, and which can be cut to meet the budget. It is important to keep in mind that many upgrades can be accomplished in the years to come, while other elements (such as the size of an addition) are better addressed at the onset of the renovation. One of the best ways to keep your project on track and keep your home in a livable condition during construction is by reducing the volume of clutter in the areas surrounding the renovation site. In the case of kitchens and bathrooms, begin by pulling everything out of cabinets and off counters. Next, aggressively sort those items, choosing which things to keep, which to throw away and which to donate or sell. In some cases, it makes sense to store the remaining furniture, appliances and other items while the project is underway. At Zippy Shell Greater Columbus, we offer different storage and moving options to suit your needs, no matter the size of your remodel project. Give us a call today to learn more about our services!